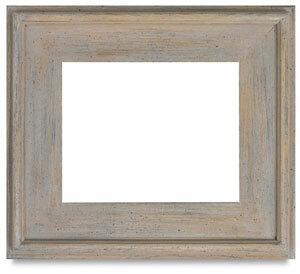 An extremely versatile, beautifully simple, wood frame for paintings, prints, watercolors, photos, or mirrors, in finishes to fit all your needs. The frames are 3 ¼" wide with a ½" rabbet which allows for stacking of multiple layers of mats. These beautiful plein air frames in golds and silvers are finished with the "Old World" technique of showing hand leafing lines between each individual leaf that reveals a thin black separation line.